Today I’m reintroducing you to a friend of mine with a ton of guts– Ashlynn Pearce. She’s a young-in-years writer who’s lived a lot of life! On the day her first book, Rough Edges, came out, she had a stroke. Remember, from back in January? Even though she thought she’d never write again, she’s made her way back and is now burning up the process. I thought I’d see how and where she does it! I love this girl, so be sure you stop by the comments section and ask a question or just say hi! Me: Do you always write in your office? Ashlynn: Most the time, but not always. I have a Mac laptop hooked up to a large screen with full size keyboard- but sometimes I need a change. So I’ll take it into the living room with me. Especially if I’m doing edits. Ashlynn: I’d have to say my office. It’s a cool place. Me: Hm. Okay, where’s the weirdest place you’ve ever written? Ashlynn: Years ago, I would go to Panera Bread or Barnes and Noble and write there. I really enjoyed that. Since I’m not allowed to drive any further than the bank, which is two minutes away, I don’t do that anymore. Me: Do you do anything before you write? Light a candle? Dance around the house? Ashlynn: I kinda have a pattern. I do email, blogs, social media first and then hit writing. Ashlynn: My goal is to write every day during the week but because of health issues, that doesn’t always happen. And life can sometimes get in the way. Laundry doesn’t wash itself. I don’t usually try on weekends. Family time and whatnot. Me: So tell us about the atmosphere in your office. Ashlynn: It’s colorful. 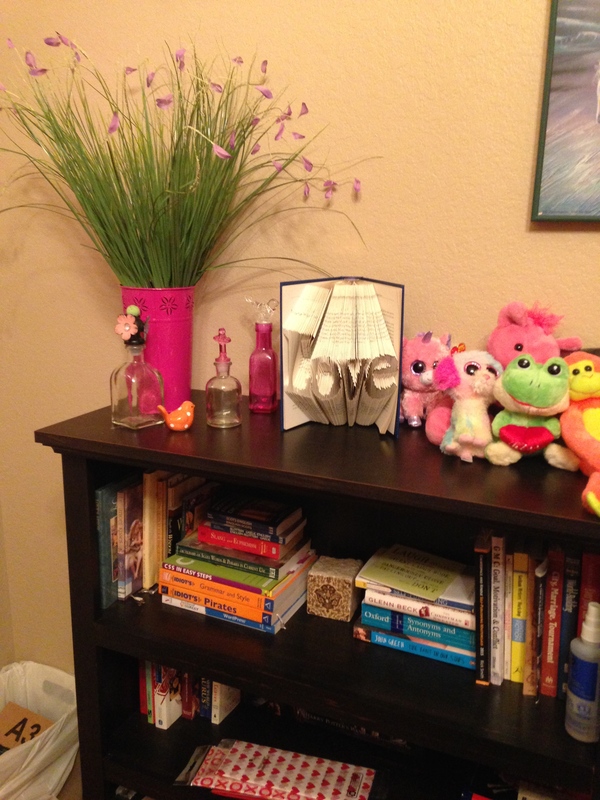 Bright pinks, blues and purples decorate my office. Hubs won’t let me paint the walls a crazy color, so I do it with nick-knacks, a very colorful rug and bright pink curtains. That said, I love to write when its raining. It’s my favorite writing weather and I like my office dim. I realize that’s a complete contradiction, but it’s no secret I’m a li’l odd. Me: You listen to music while you write. How do you choose the music? Ashlynn: I have playlists for every book I write. And the music depends on the story. But I always have music playing. I can’t write without it. If you want to listen to the music that inspired my books, you can follow all my playlists on Spotify here 12169150219. There is a wide range of music and it all depends on the characters. Ashlynn: You know, this is going to sound weird, but I have it. There are two large windows in my office that face our waterfall and pond. I can’t see it, but I can hear it if I open the windows. I have my favorite gargoyle licking a pen on my desk. I have a stuffed dog my son got me when I had my stroke and it went everywhere with me. It’s had MRI’s and all sorts of tests done on it. A picture of my hubs and the kids when they were little. A pen holder in the shape of a pink tulip. A replica time-turner from Harry Potter. Me: So how did you come by this magical writing space? 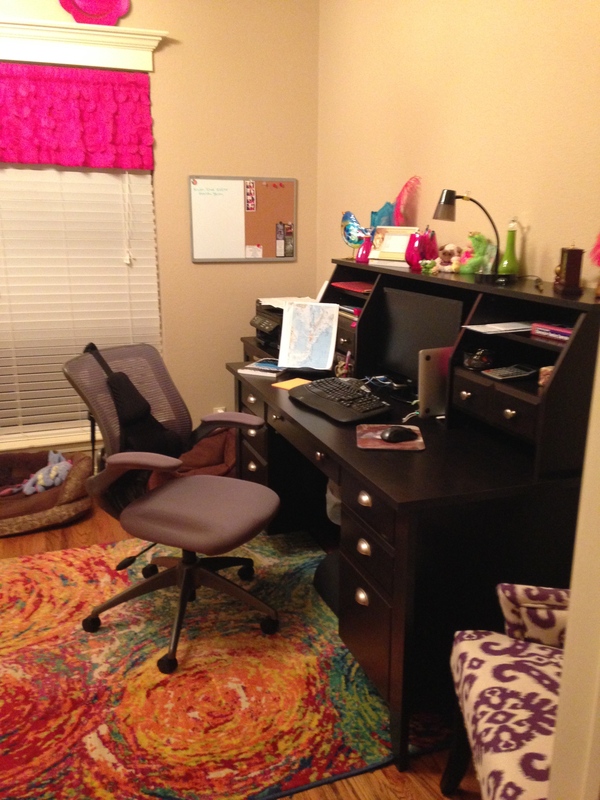 Ashlynn: This room was originally supposed to be a very open formal dining room. But, it was very important to my Hubs that it was closed in and double French doors put in before we even moved in. That he made it so important, makes me love this room that much more. Ashlynn: How did I get started? A dream. No, literally, I dreamed a story. And thought, why not? So I bought a good pen and a notebook and started writing. I didn’t know anything about computers back then. I didn’t know what program you used to write or that there was a format that you needed to use. All I knew was I’d read thousands (and I mean thousands-I started reading them when I was 13 and would read no less than 2 a week from there on out) and this story dream wouldn’t leave me alone. No, that one isn’t published, but I plan on releasing it one day. Then I joined this amazing writers group. They taught me, encouraged me, pushed me and I absorbed as much as I could from them. (Ms. Susan is one of them, btw) I wouldn’t be the writer I am today without them. Me: I laughed because your grammar abilities are so much like mine! What books to you keep close at hand while you’re writing? Me: Click on the title to check out those books! What do you see when you look out that window? 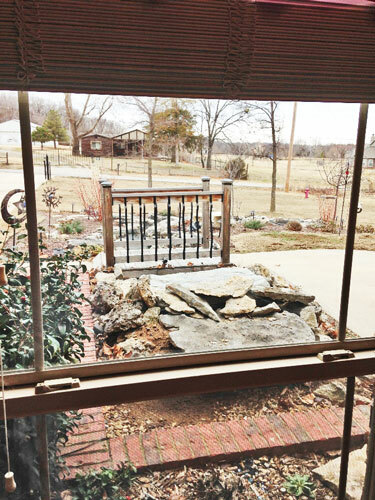 The windows face the front of the house and I see the backside rock of the small waterfall, that leads into a short creek, which falls off into a bigger waterfall and large pond. There is a small bridge you have to walk across to get to our front door, so thats in my view. In every season but winter there are all kinds of birds and squirrels that love to play in the creek and eat from the bird feeder. They are so fun to watch. My puppies hang out with me in my office and they like to bird and squirrel watch, too. Ashlynn: #1-The first draft of anything is crap. The second draft of anything is crap. If you can accept that and realize the editing and polishing are what make it a good story, you will quit worrying if you’re any good. #2- You can’t edit a blank page. And I do know that blank page staring at you with the little cursor blinking at you is the most intimidating thing in the world. (I face it every time I start a new story) Grit your teeth, hunker down in your chair and just write. #3-Don’t get caught up in the “right” way to do it. Not when you start out. Refer to step number two. And the last thing, probably the most important, find one or two critique partners you trust. Not family if you can help it. People you can bounce ideas off of and read your stuff when your stuck. Believe me, they are worth their weight in gold. Me: Do you have any advice for people who find themselves struggling through bad things that happen in life, such as your stroke? Ashlynn: Life is short. Really, really short. So chase that dream, whatever it is. Make time for it. Don’t put it off. You never know when your number is up or when the ability might be snatched from you. Take it from someone who thought I’d never be able to write again after suffering a stroke. Don’t waste time worrying about what other people think or might say. Just do it. It’s your life and you only get one. Do it your way. Thank you for sharing, Ashlynn! BTW all y’all–you can follow Ashlynn on Facebook , her website, and Twitter @ashlynn_pearce . She has a new series called Dirtslap and the first book in that series is called Fuel (click the link to purchase) and another coming on May 7th called Wreck. Categories: Small World, Small World Writers | Tags: Author, books, computer, office | Permalink. Thanks so much Susan for having me! Love you, girlie! Love you, too, Little Bit! And I’m thrilled for you!!! Great interview, Ashlynn! I learned things I never knew before. 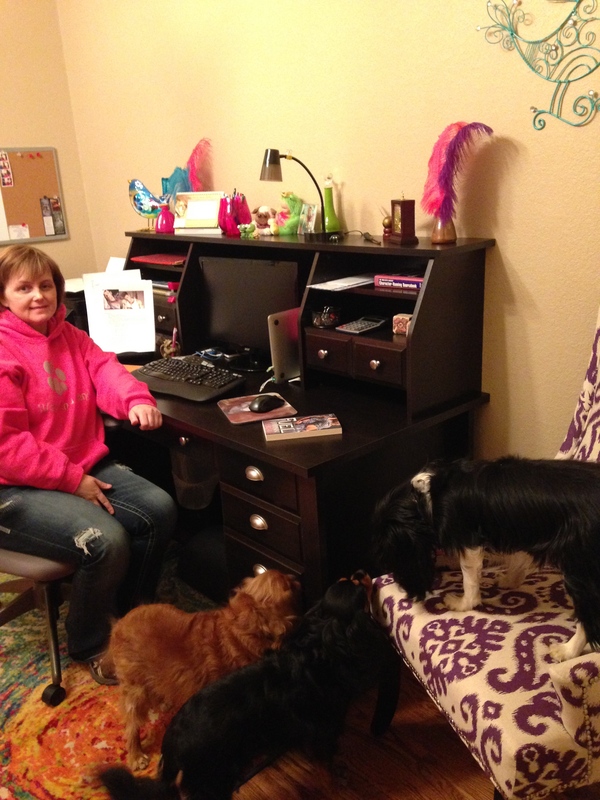 Glad you posted pictures of your office…it’s such a fun space. Can’t wait to read WRECK!! Me, too, Linda. WRECK will be great! Editing Wreck as we speak. My editor loved it, btw. 🙂 That’s always a good sign. I can’t wait for you to see it, Linda. Love my new desk!